What Is A One Person Bird? A phenomenon among the parrot owning community is the statement "one person bird". This typically means that a parrot has formed a very special, trusting and loyal bond to only one person, their favorite person, and will become aggressive toward any other person. The reason it's easier to talk in terms of a favorite person rather than mate person or person the parrot is nice to is because there can be varying degrees. For some parrots the favorite person is the one person that the parrot doesn't bite. For other people the parrot even bites the favorite person but at least doesn't go crazy in their presence. So there can be completely varying degrees but usually it is clear who the parrot likes or tolerates the best. This is an article written by a non-favorite person for non-favorite people of parrots. The aggression may involve biting, lunging, pacing back and forth, hissing, screeching, growling, raising a crest or feathers, pinning eyes, and performing an aggressive and defensive posture whenever the parrot comes in contact with someone besides their favorite person. It may involve the bird becoming aggressive in defense of their favorite person against someone else (a harmless family member, spouse, or friend). It may involve the bird becoming aggressive when any other person tries to handle the bird, such as asking the bird to step up. It may involve any other person simply approaching the parrot from a slight distance or even being in the same room with the parrot. Whatever the extent of the aggression toward any one besides the favorite person, there are some training tips and techniques which can be applied to overcome this serious problem. 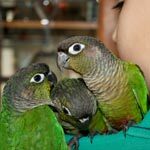 Whether you have a budgie, cockatiel, cockatoo, parakeet, parrotlet, conure, african grey, poicephalus, lovebird, eclectus, amazon, macaw or other bird that is aggressive towards other people, you can use these suggestions and techniques to overcome one person parrot aggression. Why Is One Person-ness A Problem? It is important to train a parrot out of one person-ness because coming in contact with others is practically inevitable. If a parrot owner must leave the parrot with someone else for a period of time, a bird sitter will need to be able to handle the bird in some way. The bird sitter will need to be able to approach the bird to give it its daily food and water, and the bird should be provided with some attention and interaction. It is unhealthy for a parrot to endure more stress than necessary when a bird sitter is only trying to care for it and fulfill its needs. In addition, some parrots have extremely long life spans and some parrots outlive their owners. It would be a sorry situation if someone else eventually acquired or inherited a parrot with a very long term socialization problem. Furthermore, a parrot owner's situation and lifestyle may change dramatically over years of parrot ownership. Parrots need to be properly socialized and introduced to small changes to prepare them for bigger changes like marriages, children, new friends or family members, a new owner, new homes or apartments, new furniture, new cages and so much more. Finally, if you have a visitor in your home who is curious about parrots, what could be a better way to introduce them than to a [url==http://TrainedParrot.com/Socialization]friendly, socialized parrot of your own[/url]? Why Do One Person Bird's Develop? The first thing to consider when trying to overcome this problem is a concept called "What is in it for me?" When analyzing a one person parrot situation, first consider the one person parrot's perspective. What can they get out of being with a non-favorite? It requires motivation and the parrot must want something from a non-favorite. Sometimes, aggressive behavior results from simply handling the bird the wrong way, but it's important to take responsibility for the situation. The parrot is simply learning to adapt to its environment in order to get what it wants. Sometimes it's a personality aspect of the parrot. Sometimes the person who does all the work is disappointed to find out that the bird just prefers someone else. Why do parrot's pick favorites? Some of it may have to do with the strict monogamous pairing parrot pairs form in the wild. Other parts often have to do with the fact that the person that works with the parrot the most is the most likely to become the favorite person. Humans are very possessive and like to label things as "my bird" or "his bird." The person who would label it "my bird" is more inclined to clean poop, spend time with the parrot, and put up with biting to get to spend time with the bird. The parrot sees this person the most times in a day, spends the most time with, and gets its food from that person. The other people in the household or visitors would not associate it as their parrot and would thus treat it differently than if it were their parrot. Then it is not a wonder that they would not carry favorite person status as they just haven't been around the parrot long enough or be nice enough to earn that designated status. This is why it is very important to develop shared responsibility of a parrot. Notice that it is not automatic that the person who calls it "my bird" is necessarily the owner. Ownership has more to do with who paid money for the bird but the person who would call it "my bird" is the person that feels the greatest responsibility for it. Just because you are not familiar with the parrot's individual history does not mean that it hasn't had a justifiable learning toward aggression. Even if you do know it's history, you cannot be certain what events in its life lead it to generalize aggression towards other people. The parrot could quite likely not be singling you out for aggression but just learned that no-one but the favorite person is to be trusted. This could just have to do with a lack of discrimination of other people and it just cannot differentiate you from all the people it justifiably attacked in self defense. You may have never spent enough time with it to "put a name to a face so to say" and the parrot just remembers you as "someone other than favorite person" which means bad. A prerequisite which is extremely important is training. The bird should already be trained certain behaviors by the favorite person using positive reinforcement which the non-favorite person can then use. If the bird is not trained at all, then it is better to begin by having the favorite person teach the bird a behavior called target stick training, and eventually, having the bird learn a few behaviors which can be cued by any person (essentially, tricks). To find out and learn about the prerequisite basic training process, go to this article: How to Teach Parrot to Step Up and to Come Out of Cage. How Do You Motivate A One Person Parrot To Be More Social? There is a significant difference between what you think the parrot wants and what is actually positive reinforcement. Positive reinforcement will increase behavior. Just because you think something is good for the parrot but does not increase behavior is not positive reinforcement. Free feeding a parrot in its cage is not positive reinforcement. The parrot takes that food for granted. Activities that the bird will be directly involved in and may appreciate are training sessions, giving the parrot meals, petting, and getting attention. These are the answers to the hypothetical parrot's question, "What is in it for me?". An important concept in overcoming this problem is limiting what will increase the parrot's desired behavior and giving that to the parrot in exchange for the desired behavior. If the bird never has to try in order to get what it wants, then it won't try. In order to overcome aggression from a one person parrot, non-favorite people should be more involved in the responsibility to care for the parrot in ways that the parrot will actually appreciate. The parrot won't appreciate an activity like cleaning up after it. A non-favorite person must work and try extra hard to give a one person bird a reason to want to be near them. An important question to consider is, if the parrot gets everything it already wants from favorite person, why would it want anything from anyone else? As a result, the favorite person may have to relinquish some of their favoritism and share with a non-favorite person. Start by practicing training the one person parrot hands off behaviors or tricks in presence of the favorite person. Ask the favorite person to help you or guide you with the process. The non-favorite person will need to learn the cues to behaviors and the parrot's body language. It is essential for training and taming to be able to understand how the bird is communicating with through body language and how to react to this body language. Never chase the bird with your hand. The one person bird should be learning that a non-favorite person is nice and will give them treats, it should not be forced if it is communicating that it doesn't want to be touched. The non-favorite person should give a one person bird its meals in its cage to improve the association between the bird and the person. If the one person bird needs to wear a glove to handle the bird at first, that is fine. As an extra reward, the non-favorite person should have a bowl full of food for a meal ready to give the one person bird after a training session. The non-favorite person should give the bird a command, and the one person bird should comply with the desired behavior. This may be stepping up onto the hand, being recalling to the hand, or being held by the hand of the non-favorite person in order to be put back to the cage to eat the meal. This should be repeated continually as needed (even after the relationship has improved) and it's a significant opportunity to motivate the bird to comply and tolerate a non-favorite person to get a super reward, a whole meal. This step is only effective if the parrot is on a training type of diet. If the parrot is free fed all day long, getting a meal may not be significant. The parrot should be hungry and want the meal at the moment it is served by a non-favorite person. Take the one person parrot to a new environment such as a new or unfamiliar room, a different home etc. and have a non-favorite person train or tame the parrot without the presence of the favorite person. A one person parrot will be unfamiliar with the new environment and may feel uncomfortable (to varying degrees). The only familiar and recognizable thing in the room will be the non-favorite person. Therefore, the bird will most likely feel safer due to the presence of the non-favorite person and this may improve the bond and improve training and/or taming. The non-favorite person may still have some difficulties, but the one person bird is more likely to go to and listen to the non-favorite person in a new environment without their favorite person where everything is unknown. Repeat this step throughout the training and taming process between a non-favorite person and a one person parrot no matter the extent of how much the one person parrot will tolerate or enjoy being with the non-favorite person. It is an important opportunity for the non-favorite person to be closer to the one person parrot. Between the favorite and the non-favorite people, figure out the the bird's favorite (or one of it's most favorite treats) to give the one person bird. For some parrots, a favorite treat may be a certain nut or seed, a piece of fruit, a piece of pasta, oatmeal, a piece of bread, etc. (Just a reminder: please be careful and do not feed your bird anything toxic, overly salty, overly spicy, overly sugary, overly processed etc. Make sure this food is healthy and safe for parrots!) It's really important that this favorite treat be special and be given on a rare occasion. The one person bird should be very excited and motivated to obtain the treat. The parrot should seem very excited to eat the treat and may move around or fly in an excited manner during these training sessions when the special treat is being offered. It is easy to tell when a bird enjoys a certain food if their eyes pin while they eat it. In order to improve the relationship between the one person bird and a non-favorite person, the non-favorite should start being the only source of this special treat and the treat should be limited. The only way that the one person bird will obtain this very special treat is by tolerating the non-favorite or completing the desired taming behavior of the non-favorite person. The non-favorite person should present the treat in their hand to the bird. I recommend doing these non-favorite person training and taming sessions once every few days or once a week with the very special treat so that the treat remains special and the bird does not learn to take the special treat for granted. The one person bird will begin to associate this special treat with the non-favorite person after repeated sessions. The non-favorite person should analyze the manner in which the favorite person handles the parrot in order to get desired results. Just because the parrot is tame with one person does not mean the bird will generalize and accept petting or other handling from other people. Then, the non-favorite should try to do the same thing or work toward doing the same thing with a long term training and taming process. The non-favorite should repeat any basic taming steps that the favorite person did with the one person parrot and use the special treat (see: Step 4). Always end a taming/training session with non-favorite person with a positive result. Repeat Steps 1-5 as needed until the relationship between the former one person bird and the non-favorite person has improved. Kili the Senegal Parrot used to be a strongly one person oriented parrot until recently when I was able to overcome most of these aggression issues with her, being one of her non-favorite people. This started because I was not involved in most of the training and taming processes which went on the few months after Kili was obtained, and she did not have much interaction with me. As a result, she had no reason to find me rewarding or worthwhile. She seemed threatened by my immediate presence and direct contact. She would not become defensive just because of my presence and wasn't aggressive toward me in general. The exceptions where when I approached her cage and she became territorially aggressive toward me, in defense of her cage or her perceived territory. I do not even think she was extremely jealous of me being present either. She was only aggressive toward me outside of her cage if I approached her directly (by asking to step up for example), if I came in very close contact, or touched her other territory, her foraging tree. She was not aggressive toward my presence from far away and ignored me. She just had no interest in being near me and did not find me rewarding. The mistake was made when I did not undergo the same basic taming process with Kili and give her a reason to want to be with me. Rather, I just placed my finger near her feet and gave her a step up command without first getting her to trust me. Kili did not generalize. She was completely hand tame and seemed to adore her favorite person, but she didn't trust my intentions and I was an invader. I would do training sessions with her, cuing her to perform hands off behaviors and she would comply. I would reward her for the tricks and she would accept treats out of my hand, but she was not comfortable with me touching her or me coming into her territory. I would refuse to handle Kili without wearing a glove because of a biting history with her. I started this process of motivating Kili and improving her association with me by being the person to give her meals in her cage. After a training session and being out for a while, Kili would have to step on my hand, recall to my hand and eventually be grabbed by my hand to get her meal in her cage. She would be highly motivated to go back into the cage and eat a meal, so in this case, going back into the cage is a substantial reward. This helped to improve the association Kili had for me. She would tolerate me. This really changed when I made an alarming discovery. Kili's favorite treat is bananas. The first few times, Kili was offered banana pieces in her cage during a meal as an experiment. I had heard of other birds enjoying fruits that Kili didn't seem to enjoy. She tasted it and left it in the bowl a few times. Kili refused to eat the banana at first, but I kept trying with her and I kept offering it to her in her cage along with her vegetables. After the third or fourth time, she ate all the banana pieces in her food bowl and filled up on banana instead of eating most of her vegetables, her typical meal. She had a bulging crop full of banana and a messy banana beak that day!! I learned that Kili would become extremely motivated and excited to earn a piece of banana. I watched her eat it and her eyes pinned continually. I stopped giving Kili banana in her cage with her meal, and instead, I used it to my advantage. I motivated her with easy taming steps in exchange for super treats, small pieces of banana. I would cut two slices of banana, about a quarter inch thick each (and I'd eat the rest later! ). Then I'd cut these two slices into smaller pieces, which made about 10-12 super banana treats. She would only get these treats from me, and she seemed to tolerate me to any extent for them. She would fly over and follow me around the room among her various perches, foraging tree and cage with the small plate of banana pieces for her. I wanted to practice taming and training in all of the areas she usually went to, all of her territories. I had to repeat the basic taming steps that she went through with her favorite person to teach her that me touching her is rewarding. I did this in a gradual process. First, I had to find the threshold. I put my hand close to her (without touching) and she would walk away from it. Walking away or flying away is a good thing because it's communication that the bird doesn't want it, and if you chase the bird with your hand after it has communicated to you that it doesn't want it, expect a bite, and if you have a bigger parrot than a Senegal Parrot, expect a bigger bite. This is extremely important for me. The one rule that I always follow with handling Kili is that I never chase her with my hand. I began by rewarding her right before the moment she would try to walk away from me. I would put my hand very slowly as close to her as I could (without touching, at first) and then right before I thought she was going to try to move away from me, bring my hand back and give her a banana piece. Slowly and gradually with each time, I was able to bring my hand closer and closer to her and she wouldn't walk away. Then, I was able to touch her. With each time, I touched her more and for a longer duration. Finally, I was able to wrap my entire hand around her (gently of course) and pick her up, and then put her down. I increased this duration as well. This process occurred over a few training sessions. However, the first few taming sessions would be dedicated to an entire typical training session (instead of typically doing just tricks, Kili would be tamed instead with seeds and banana treats as well). As more and more progress was made, these sessions would occur at the end of regular training sessions with her favorite person, because they required the least amount of motivation from her, especially as more progress was being made. All these taming sessions truly require is that the bird remains calm to get a very easy and special reward. At first, I would reward Kili for each time I tried to progress with her further. Eventually, I began to use a variable ratio of reinforcement. To learn about variable ratio of reinforcement, go to this topic on the parrot forum: Variable Ratio Reinfocrement vs. Continuous Reinfocrement?. I would also vary the behaviors I wanted from Kili. Sometimes, I would try to recall Kili to my hand, sometimes ask her to step up onto my hand, and sometimes hold her in my hand. This reinforced her stepping up onto my finger, and now she has an improved association with my presence and with me handling her. I brought Kili to new environments and did more taming and training sessions with her. I was the only familiar person, and everything else was unknown. After making some progress with Kili, she would perform tricks for me and would participate in the taming sessions in new environments quite easily. There is noticeable improvement with Kili. After not seeing Kili for a few days at a time, when I do see her again, she seems very excited due to my presence. After not seeing her for days at a time, I can approach Kili's cage and she will start to behave in a very enjoyable manner. She approaches me with excitement, opens and closes her beak rapidly, clicks her beak, pins her eyes, and sometimes makes slight vocalizations if I talk to her during this time. She has also noticed a pattern. If I go to the fridge and take out one of her food bowls, she flies about in an excited manner from perch to perch or comes close to me to watch me prepare her food and prepares for me to approach her so she can go back to her cage. If I prepare a banana to tame/train her, she will fly closer to me and anticipates getting pieces of banana. She has began to fly and land onto my shoulder to watch me prepare food for her, something that she never used to do. (Though I don't like her doing that because she will bite my shirt or neck sometimes, I think out of curiosity). Once again, I never force Kili. She is fully flighted and she can fly away to avoid me if she wants to. If she is moving away from me (walking, flying, etc.) than I do not chase her with my hand. If it seems like she doesn't want to be grabbed and is moving away from me, instead, I stop, bring my hand back, and turn my whole body away from her. She loses her opportunity to get a reward. If she doesn't want to get a piece of banana for doing something so simple, that's her problem. I turn back toward her after a few seconds, and try to approach her again. Usually, I can approach her the first time, or after a second or third time for a grab attempt. If this doesn't seem to be working however, I stop trying to grab her. Instead, I try to remind her of the reward by doing something she is more comfortable with, asking her to step up instead. If she does not want to be grabbed, she will usually step up onto my finger instead. Improvements with Kili show that she finds my presence rewarding, motivating and wants to be near me. Most pleasant of all, she will now lean into my hand or walk into my hand when I am trying to grab her and hold her. It is very clear that she wants to be held and trusts me more than ever. I will be trying these steps with Sheldon, he step's up perfectly fine but does not let me pat or touch him. Some Great info here, thanks for posting this! Just wanted to ask a question. The closest Sheldon will let my hand come to him before he lunges out to bite/hit with his beak is about 20 cm. So I start at this length first and then slowly get closer and closer with my hand over time? oops, sorry about the double post..
Wow Sheldon progressed really fast. I didn't rush him and made sure that he was comfortable with what I was doing. I touched him 2 times in the last session and hopefully in his training sessions tomorrow it will continue to be a success. I just wanted to offer a couple of pointers that I forget if they were mentioned in the article or not. 1) Get all your training done earlier in the session and taming toward the end. Doing tricks or even targeting takes more will power and energy than "not biting you" for a treat. 2) Use the taming process as a way to gain your bird's trust. Rushing this will not achieve trust. You may be able to use the process to touch the bird by then of one session, however, that doesn't mean the bird is comfortable with you there yet. The treats are just compensation to the bird for tolerating some minor discomfort but the trust building is across a lot of repetition that you won't do anything bad. Eventually you should not have to give any treats for taming behaviors like grabbing, touching, and petting. I am having an issue with my bird and my daughter. He was on his cage on his playpen and my daughter put her face (dumb, I know) up near him to try to grab a kiss, like I do, and he lunged at her, like from other side of his playpen area, he got to her side so fast, it scared me. He didn't get her or bite her, but it scared her and she cried. She is 13 and it really hurt her feelings. She does not know what she did to him to make him not like her and I told her it could even be her hair which is curly and might seem scary to a bird like this big bushy thing is coming at him. She also was not here when I brought him home. She was visiting relatives out of state, so she came home and he was here. He also does not want the other kids picking him up and will nip. He nips me too but it does not scare me and he never lunges at me and when he bites me it seems more like preening or playing. Gonna try some suggestions from the article above.